MilaX 0.3.1 Launched - This release is based on OpenSolaris Nevada 89. 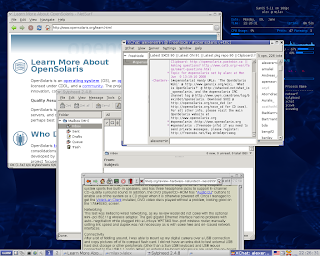 MilaX 0.3.1, the latest edition of the operating system formerly known as Damn Small Solaris, was launched yesterday. It is a mini-distribution based on OpenSolaris and was created by Alexander R. Eremin. MilaX 0.3.1 is based on OpenSolaris Nevada 89 and, if you have a system with more than 512 MB of RAM, the Live image will be mounted directly into the memory, thus allowing you to eject the MilaX LiveCD after the boot-up. This edition brings some real changes, especially on the desktop side. The IceWM window manager was added and JWM (Joe's Window Manager) was removed. The latter is a window manager created by Joe Wingbermuhle, who wrote it in C, and it looks somewhat similar to the interface of Windows 95. Moving on to system monitors, Conky replaced Torsmo (TyopoytaORvelo System MOnitor). Conky is a lightweight system monitor for X, that displays system information directly on your desktop. The small web browser Dillo was re-included in MilaX 0.3.1. This browser is suitable for older computers and comes with increased security; its first version was released in December 1999. MilaX comes with Xchat, in case you want to talk on IRC channels, and Xpad for note taking. IFTop, the tool that displays the bandwidth usage on a specified interface, was included in MilaX 0.3.1, so you will easily keep an eye on your network traffic. The Cisco Discovery Protocol Reporter (CDPR) is another useful tool that made its way into this distribution. CDPR can show the switch and port that a machine is connected to (this works only if the device supports CDP). Two new scripts, Screen Resolution and X Keyboard Layout, and the X-Startup SMF service were also added. As MilaX comes in two versions, desktop and server (without a GUI), you should know that the server edition includes Apache, PHP, Samba and NFS servers, GCC, Lynx and many other applications. Download MilaX 0.3.1 right now from Softpedia.